Modeling and simulation of batteries, in conjunction with theory and experiment, are important research tools that offer opportunities for advancement of technologies that are critical to electric motors. The development of data from the application of these tools can provide the basis for managerial and technical decision-making. Together, these will continue to transform batteries for electric vehicles. 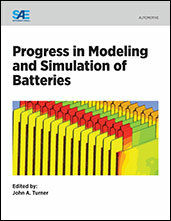 This collection of nine papers presents the modeling and simulation of batteries and the continuing contribution being made to this impressive progress, including topics that cover: •	Thermal behavior and characteristics •	Battery management system design and analysis •	Moderately high-fidelity 3D capabilities •	Optimization Techniques and Durability As electric vehicles continue to gain interest from manufacturers and consumers alike, improvements in economy and affordability, as well as adoption of alternative fuel sources to meet government mandates are driving battery research and development. Progress in modeling and simulation will continue to contribute to battery improvements that deliver increased power, energy storage, and durability to further enhance the appeal of electric vehicles. If you do not have access to SAE MOBILUS via username/password or institutional access, you can still purchase the Progress In Technology (PT), Progress in Modeling and Simulation of Batteries.